When I don’t go home for the Holidays, I like to incorporate a few dishes that bring a piece of the South to my mouth. Sometimes I make a Cajun Turkey, but this year I thought I’d try something different. And thus this recipe for Southern Sweet Tea Brined Turkey Breast was born. This brine is really easy to put together and makes the turkey oh-so-tender. It practically fell apart when I was trying to slice it. If you’ve ever suffered from dry turkey, I’m writing you a prescription for this sweet tea brine recipe! A whole turkey is just way too much meat for a few people so I chose to do a breast. If you want to brine an entire turkey, all you need to do is double this recipe. Bring the water to a boil in a large pot. Add tea bags, turn off and let steep 10 minutes. Turn the heat back on medium-high. Add the salt and brown sugar. Stir until completely dissolved. Add onion, lemon, orange, and garlic. Remove from heat. Add peppercorns. Let cool. Once brine has cooled completely, put your turkey breast in a turkey bag and cover with the sweet tea brine. If the brine does not completely cover the turkey, add some extra water. Secure bag and refrigerate submersed in the brine for 12-24 hours. Place turkey in a baking dish (mine fit perfectly in a 9×9). It is optional, but you can place additional freshly sliced lemons and oranges around the turkey to help keep it juicy. 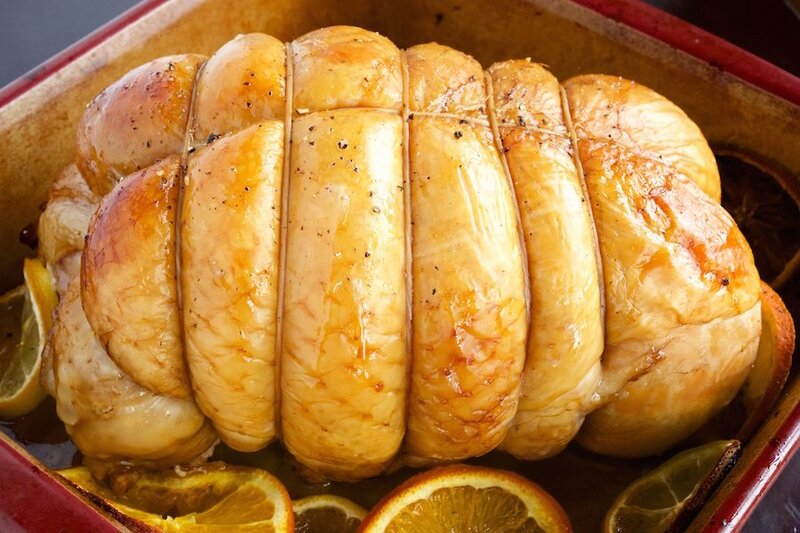 Drizzle some olive oil over the top of your turkey breast. Sprinkle a little salt and crack some fresh pepper over the top. Roast at 450F for about 40-60 minutes, until the internal temperature reads 170F. Let rest 10-15 minutes before slicing. I’ve never heard of this type of brine but it makes sense. Sounds yummy! What a great idea, your turkey breast looks delicious and juicy! That turkey looks amazing! That color is just gorgeous! I live in North Carolina and I’ve never heard of the sweet tea brine, but is sure sounds like a great idea. I just spent 2 years in the South, and was amazed at how popular sweet tea was! This is such a great use of it! 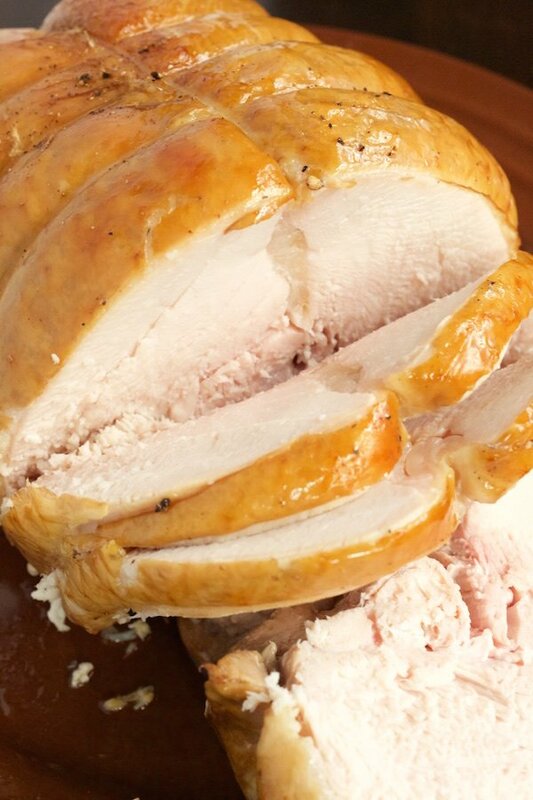 I can tell just from the pictures that the turkey meat is super moist and tender. I know from experience that is not easy to accomplish! The Turkey looks amazing! Adding it to my list for Thanksgiving 2016! Jeeze, I would love to win that gift card. I would get a new laptop. I love how juicy brining makes turkey. I have never brined with tea before, though, I have to say, this looks wonderful! I’d probably buy movies. This post has made me thirsty for sweet tea…and I never even drink it. Hi! This sounds great 🙂 Quick question – you have peppercorns in the ingredient listing but I don’t see them used in the instructions. Did I miss them? Or are they just ground up for the pepper? Thanks!! So sorry, I must’ve forgot to mention them. Add them to the brine when you remove it from the heat. Hope that helps! Love the idea of the sweet tea. I have a turkey breast in my freezer, I might have to try this! I lived in the South my entire life up until the last 6 years and have never heard of this. What an interesting idea! The brine you use is incredible yummy! I usually use tea brine for eggs. thx for sharing wonderful recipe. What a unique recipe~never heard of sweet tea brine. Trying this one out for sure. Janica, I love all of your recipes, and this is no exception! Sounds absolutely divine. I can’t wait to try the brine with my Christmas turkey. Does the cooking time change if its not a boneless breast? The turkey breast I have is 7lbs but its not boneless. I imagine there would be a difference, but I’ve never cooked a bone-in breast, so I’m not sure. Start checking it a little early. When it is 170 degrees Fahrenheit in the thickest part, it is ready. 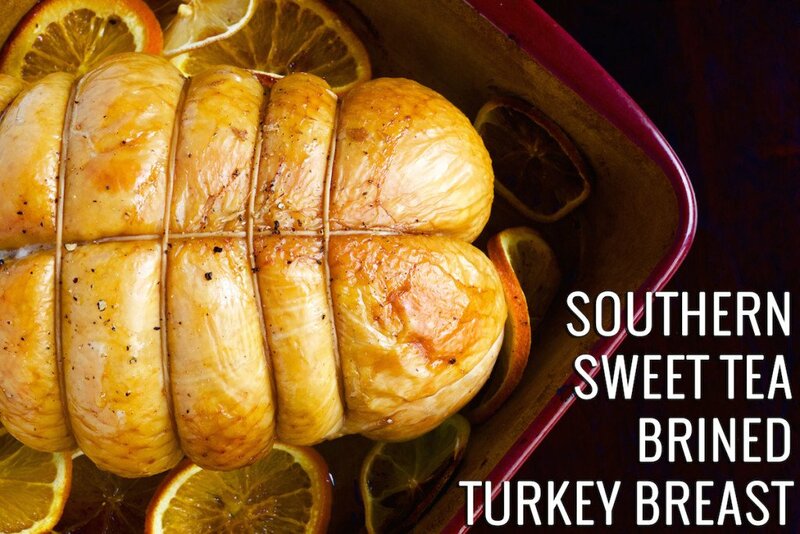 Could you use this brine recipe when cooking a whole turkey? If so, what would be the oven setting? Yes, but you will need to at least double this brine recipe. Just roast like normal, at 325 F.